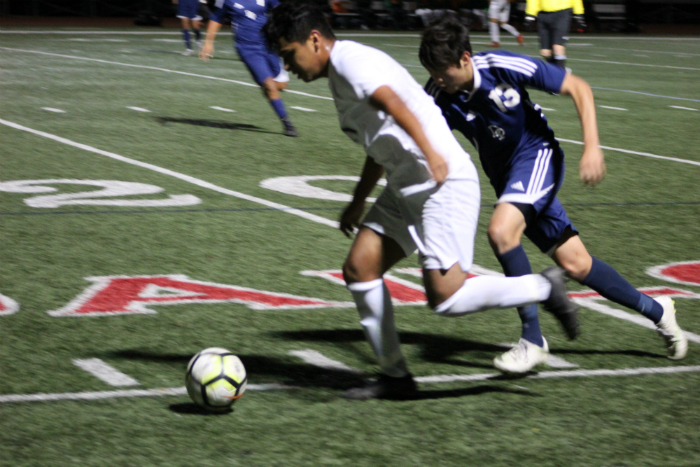 Juan Carlos Torres scored two goals and the Santa Barbara High boys soccer team cruised to a 3-0 Channel League victory over rival Dos Pueblos on Monday night at Warkentin Stadium. The Dons shocked Dos Pueblos from the opening kickoff as Torres and Brandon Garcia worked a give and go combination on Santa Barbara’s opening possession of the game that sprung Torres free for a left-footed shot that found the back of the net. The Chargers shrugged off the early goal and narrowly controlled possession for the remainder of the first half, but struggled to truly challenge Santa Barbara goalkeeper Connor Lambe. A shot on frame by Fernando Ochoa required a Lambe save in the 9th minute. Lambe followed that up with another save of a Hayden Carlson shot in the 20th minute. Santa Barbara took it’s 1-0 lead into halftime and caught a huge break when the Dos Pueblos goalkeeper stepped out of the 18-yard box with the ball setting up a free kick from prime position. Torres crushed a right-footed shot to the right of the Dos Pueblos goalkeeper and into the upper corner of goal. The second goal was deflating for Dos Pueblos, but the Chargers nearly narrowed their deficit with a Mori Chiba header in the 49th minute. The ball bounced directly into Lambe’s arms for an easy save. The Dons increased their lead in the 78th minute when Pedro Guillen finished off a cross from Riley Svensson. With the victory Santa Barbara improved to 4-3 overall and 2-0 in Channel League. Dos Pueblos dropped to 6-5-1 and 0-1 in Channel League. Barbara Gonzalez scored the decisive goal off a cross from Natalia Veladores in the 68th minute, giving the Chargers a key Channel League victory.